SCOTLAND lock Jonny Gray has signed a new three-year contract with Glasgow. The 21-year-old has followed World Cup team-mate Finn Russell in extending his stay with Gregor Townsend’s side until May 2018. Gray has made 40 appearances for Glasgow after following his brother, Richie, into the team in December 2012, and has won 19 Scotland caps, four of them during the World Cup. He said: “I’m very happy to be staying at Glasgow. It’s my home club and I’m just glad I’ve had the opportunity to sign. It’s been a a fantastic few years’ development for me. When I was younger I always had the ambition to play for Glasgow and Scotland, and playing in a Rugby World Cup has been a fantastic experience. “It’s great to see Finn signing as well and there is a lot of talent at the club and it’s great to be a part of it. “Everyone works very hard and that just makes you want to improve as a player and improve the team as well. To have the opportunity to work with the coaches and players at the Warriors is fantastic. Scotstoun is a fun place to be, and everyone works hard for each other and the culture is great. l Edinburgh’s Fraser McKenzie has been handed a two-week ban for “charging into a ruck or maul” during the defeat by Connacht in Galway on Saturday. 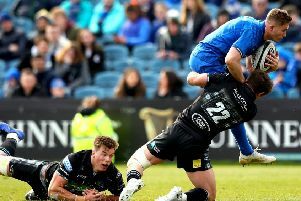 The lock forward was cited and summoned to appear yesterday before an independent Pro12 Rugby Disciplinary Committee. McKenzie accepted that he had committed an act of foul play but argued that it had not been serious enough to have warranted a red card, had it been spotted during the game. The disciplinary committee, chaired by Roger Morris of Wales, disagreed after viewing footage of the incident and listening to evidence and representations from and on behalf of the player. A statement said: “The Disciplinary Committee found that there were no aggravating factors, and, although there were mitigating factors (including Mr McKenzie’s previous clean disciplinary record and his conduct at the hearing) these were insufficient to allow full mitigation. McKenzie will miss Saturday’s Pro12 match against Munster at Murrayfield and the European Challenge Cup home tie against Grenoble on 13 November.